Although many of these extras may be appealing, upgrades will increase your final purchase price. Not sure which upgrades you should add now and which can wait? Take a look at our breakdown. Adding or expanding rooms, moving walls or making any structural changes will be cheaper and easier during the building phase. Renovations aren’t just expensive – they are disruptive as well. Depending on the scope of the project, remodeling may take weeks or months, and you may need to move out of your home temporarily. Although upgrades to the structure or the square footage of your home are among the most expensive options, they’re still much more cost effective than renovating your house. Light Fixtures: You may not love the standard choices for kitchen light fixtures, but as long as the lights are functional, they can easily be replaced a few months or even years from now. Paint: Delaying a custom paint job may also make sense if you’re watching your upgrade costs closely or can’t make up your mind about the ideal paint colors. Luckily, the neutral colors that come standard with your home won’t clash with your furniture. Painting may disrupt your life a little for a few days, but it’s one of the easiest and cheapest renovation projections. Hardware: Door and cabinet knobs and pulls are easy to replace yourself. However, although these items may not be expensive individually, the cost can add up if you’re swapping out all of the hardware in the kitchen and bathroom. It’s always easier to perform electrical and wiring work while your home is being built. If you wait to add additional fixtures or outlets, your electrician may need to remove drywall to access wiring or even run ugly conduit along the walls in inaccessible locations. It’s much easier to turn your new house into a smart home if you add the wiring before your builder closes the walls. Thanks to innovative technology, you can control your appliances and heating and air-conditioning system from anywhere, automate your shades, monitor security cameras and check the contents from your refrigerator from your smartphone. All Country Classics homes offer pre-wired access points to be smart home ready as a standard included feature. Appliances costs can vary by thousands of dollars depending on the brand name and features. If a top-of-the-line Wolf range is a want but not a need, you may decide to wait to add the pricey appliance to your kitchen. At Country Classics, we offer high-quality GE® electric double wall ovens and 4-burner gas cooktops as standard appliances that will meet your needs until you’re ready to upgrade. You can always add more expensive appliances later. Flooring is another one of those items that will be more expensive to add later. Whether you want to add hardwood flooring to the bedrooms, upgrade your carpet padding, or cover your foyer floor in marble, you’ll save when you add flooring changes to your building list. Do you envision a lush backyard full of trees, shrubs and flowers? Luckily, it’s easy to add plants and trees later once you've already moved into your home. Are you considering adding a large outdoor entertaining area to your home? You may want to delay building a patio or deck until you can observe which parts of your yard are shady or sunny during various parts of the day. Your kitchen is the heart of the home, so why not invest in it from the get-go? 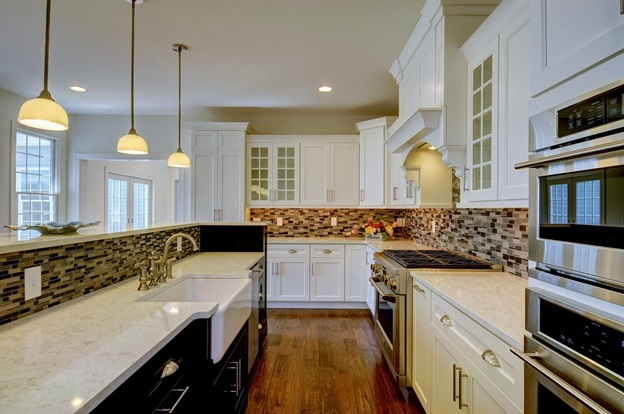 Taking advantage of cabinet and countertop upgrades will add a dramatic visual impact to an area where you will spend a great deal of your time each day and will help increase your home's resale value. If you replace your cabinets and countertops after you move in, your contractor may need to move your appliances, which could void their warranty. The project will also be costly and inconvenient after you've already moved into your home. Personal touches make your new house feel like home. If you’re looking for a new home community with plenty of upgrade options, you’ll want to pay a visit to Country Classics at Hillsborough. The four-bedroom, 2.5 bath homes offer large gourmet kitchens, home offices, formal living and dining rooms, family rooms with gas fireplaces and spacious master bedroom suites. Contact us for information about our final phase.